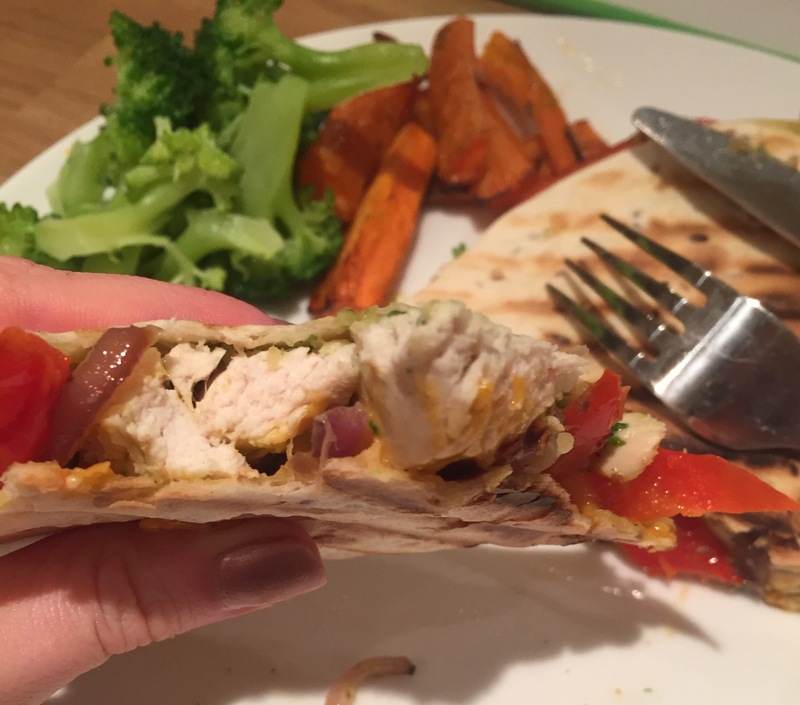 This recipe was a bit of a spur of the moment idea and turned out to be ridiculously delicious. 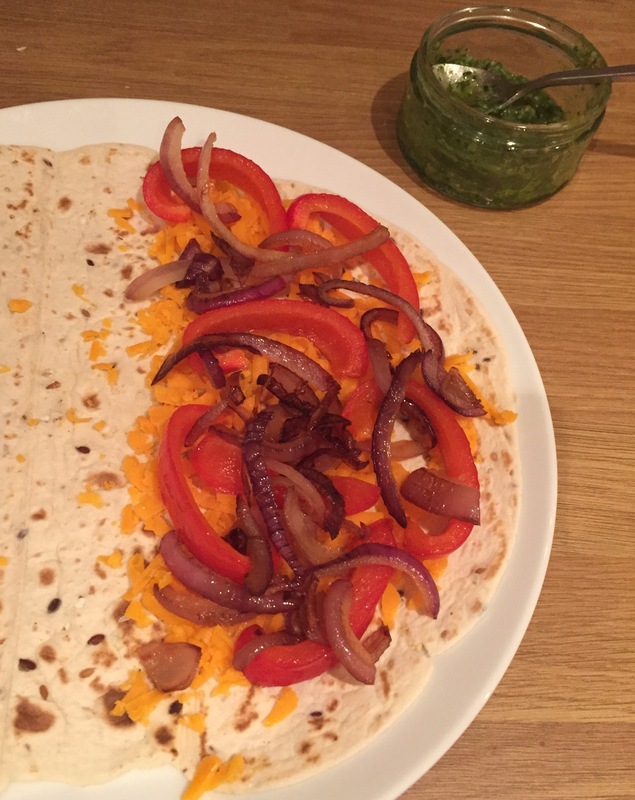 It’s a little bit naughty with the wrap and melted cheese….but everything in moderation…. 1. Add a little olive oil to a small frying pan. 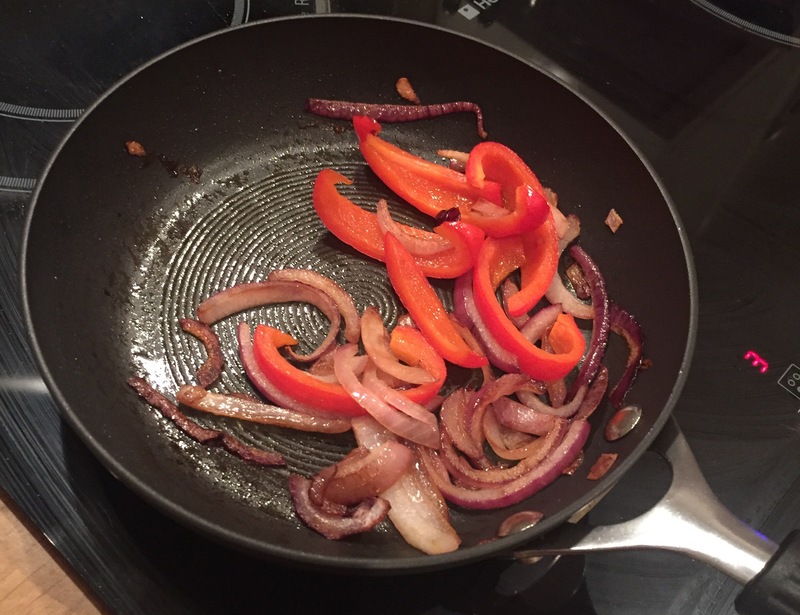 Slice the onion and pepper as you would for fajitas and gently fry this off until the onion is caramelised and the peppers are starting to soften. 2. Preheat the oven to 180c. 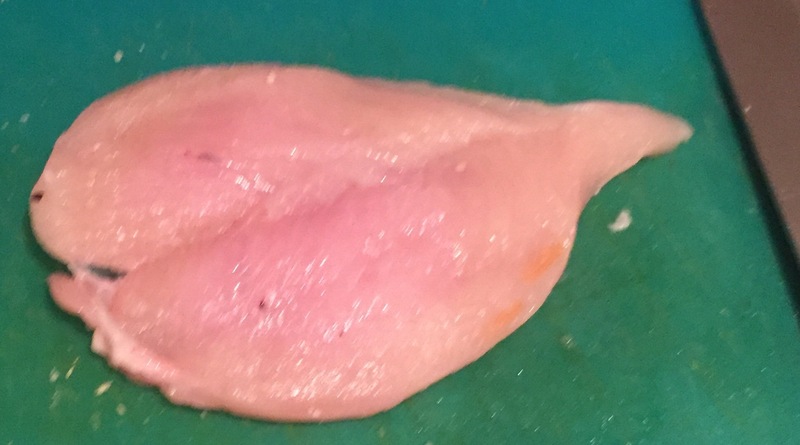 Prepare your chicken – I butterflied mine so that it would cook more quickly and evenly by slicing along the side of the breast (lengthways) as if I were cutting open a roll, then folded the top back so that it was half the depth and double the width, as above. 3. 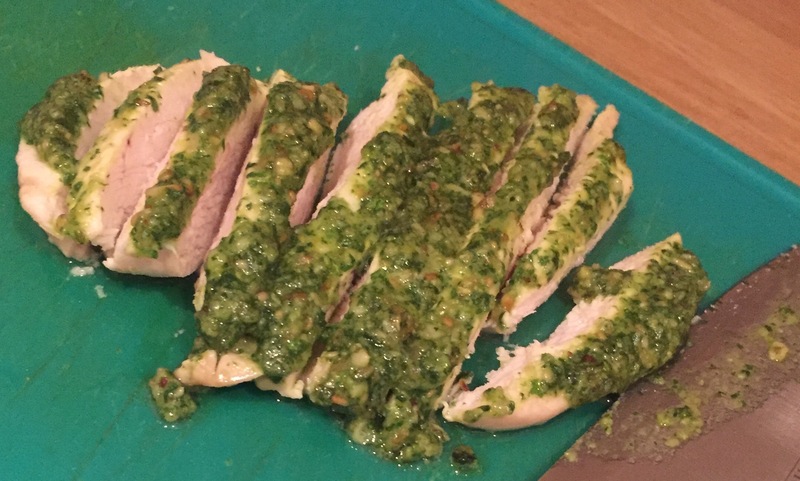 Spoon the pesto onto the chicken and spread it out to coat it. 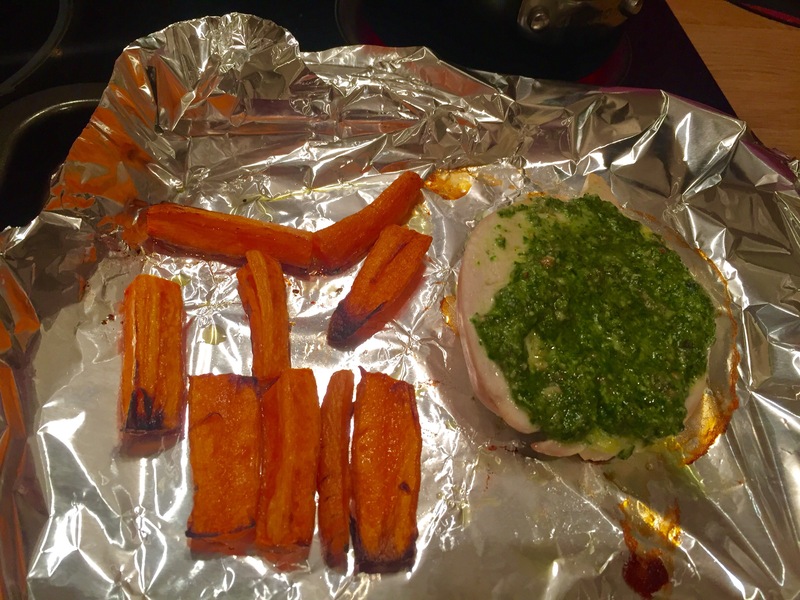 Put on a tray in the oven for 10-15 minutes until cooked through. 6. 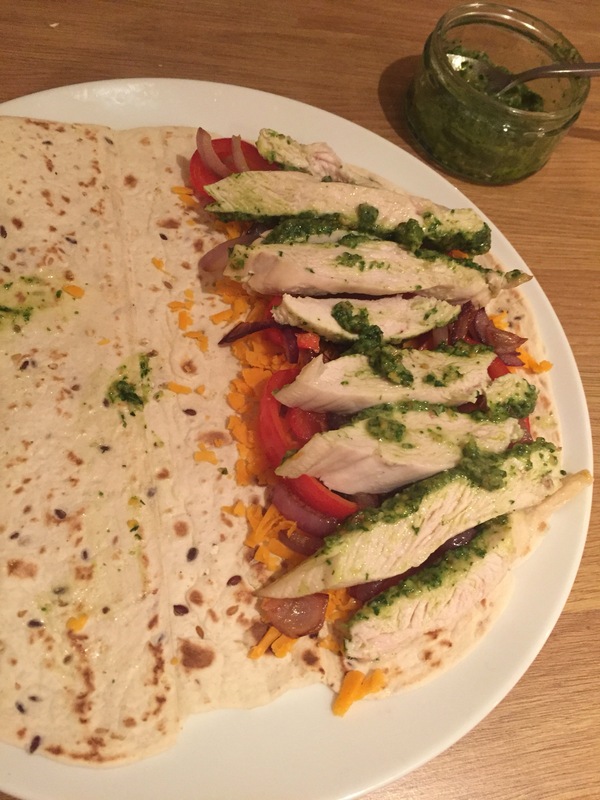 Once the chicken has cooked, slice it up, keeping the pesto on top, and later it onto the peppers, onions and cheese. 7. Look how good it looks already! 8. 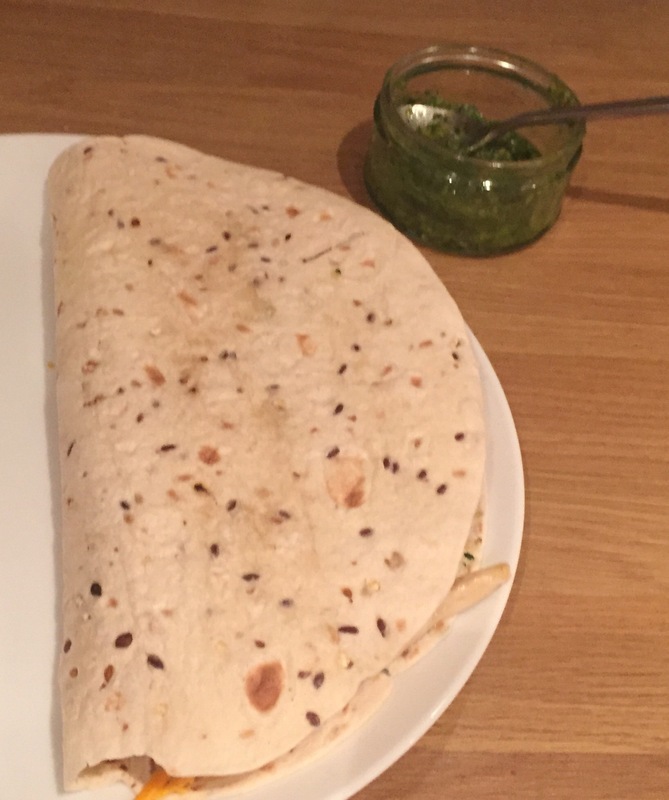 Now fold over the bare side of the wrap into this sort of giant, flat taco shape, and place your griddle on medium to high heat (not too high as it could burn whilst you’re trying to melt the cheese). 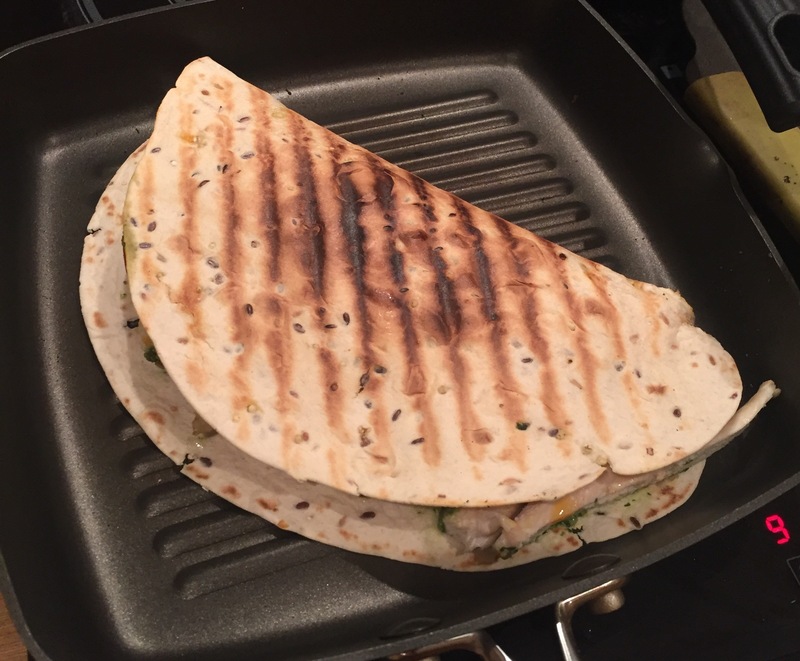 If you don’t have a griddle pan, a large frying pan will do the job but you won’t get the “I’m a big show-off” grill lines- no oil necessary; just a dry pan will suffice. 9. 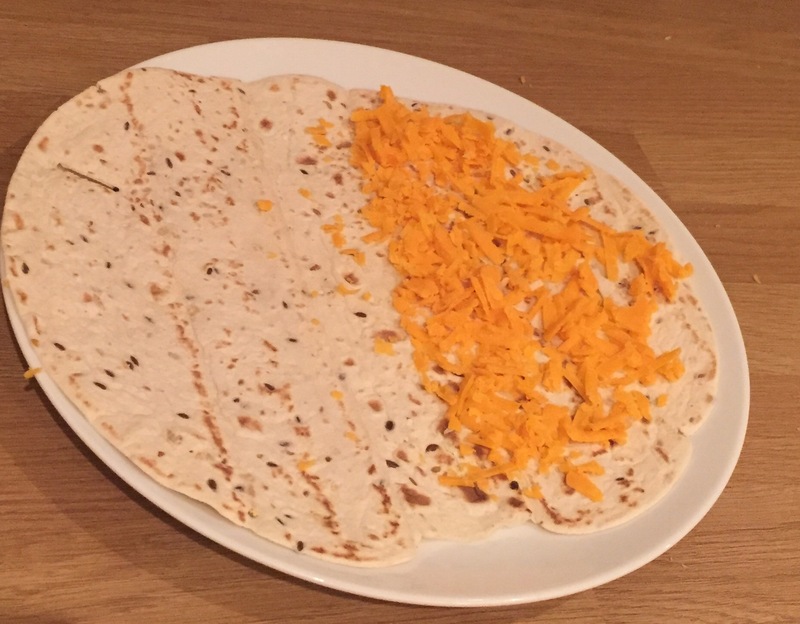 When the bottom is starting to brown abs crisp and the cheese is starting to melt, flip it over and repeat on the other side. 10. Check the cheese has melted and serve. 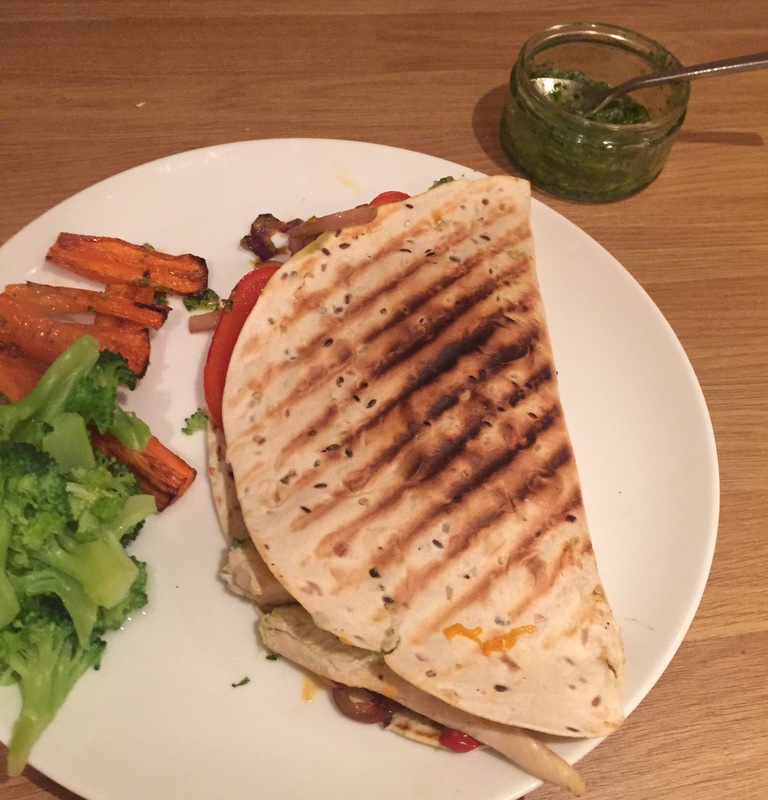 If you don’t to share or get neat about things, cut it into triangles (like a pizza)…but this was my supper and I wanted it to look giant! 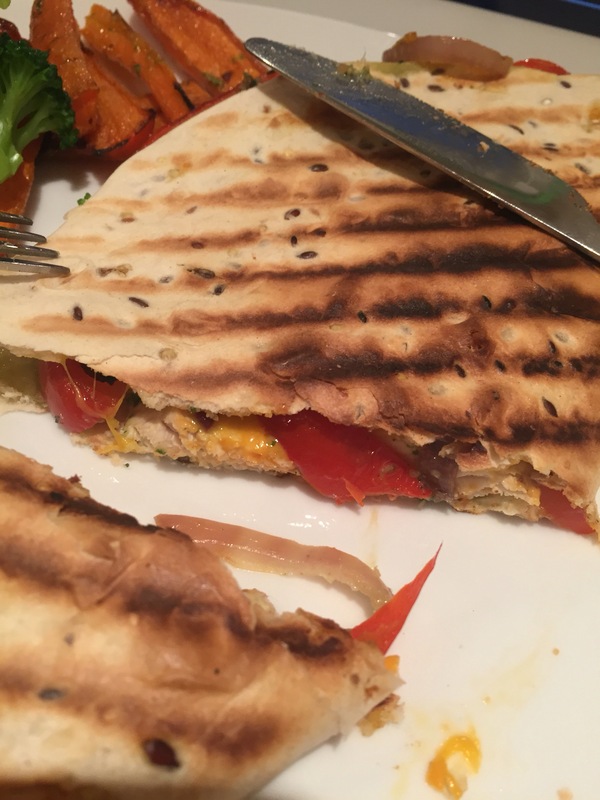 You know you need this….